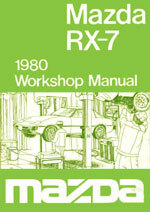 This workshop manual is the most comprehensive manual available for repairing and maintaining your Mazda RX-7 Series 1. Suitable for the home workshop mechanic or professional technician this manual will help you repair and maintain your RX-7. Very easy step by step instructions with lots of diagrams. Plus the 1980 Workshop Supplement and the Wiring Diagram Supplement. Mazda RX 7 Series 1 1979-1980 Workshop Service Repair Manual $9.99 Immediate Download!